or Full-Motion Video as your Screen Saver ! concert footage, live events, news, webcasts, "Big Brother" and more! View "live" Streaming Media or full motion MPEG, AVI, ASF or WMV clips as your Screensaver! Use our intuitive setup and preview tool to create a "playlist" of media clips with full audio support. Watch video on your PC! Concert Footage - Live Events - News - Webcasts - "Big Brother" - and more! GetRight compatible - so you can monitor the status of your Internet downloads while your screen saver is running. Unlimited Number of Media Clips: Create a list of your favorite Streaming Media, MPG, AVI, ASF or WMV clips using our handy image preview tool, and cycle through them for display. - Create a playlist of media clips to be displayed, or point to any directory of clips on your hard drive or network. 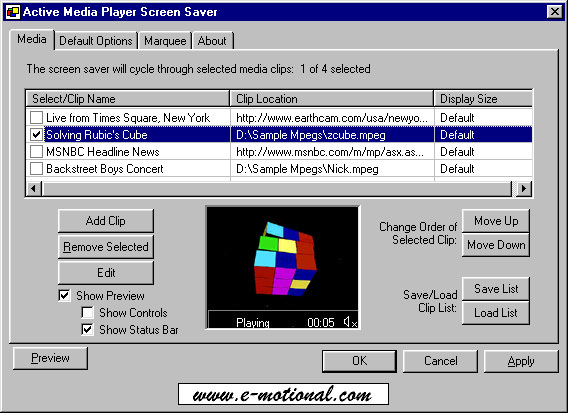 Play Local or Remote Files: The screen saver will display media clips that are stored locally on your hard drive, or access them via a network or Internet connection. Manage your media clip playlist: Save/ Load it as a file - and share with friends! Visit our playlist FAQ to learn more about saving a playlist, or to load one of our sample media clip playlists. "Drag and Drop" Playlist: select one or several clips from a directory, and drag them all into your playlist at once! User-configurable speed setting for scrolling marquee text: slow, medium or fast. Full audio support! Play the video clips with or without audio. Press the "F3" function key while the screen saver is running to easily enable/mute audio. GetRight Compatible: If you use the award-winning GetRight utility to download files from the Internet, the Active Media Player Screen Saver will display status information, such as the file name and percentage of the download completed. You don't have to disable your screen saver to keep track of your downloads! Fast-function-keys: Provide fast access to screen saver controls! Press "F9": To advance to the next media clip in your list. Press "F3": To mute/restore audio. Press "F4": To pause the media clip. Get the latest news on promotions and releases! Quick-Launch Icon. Click on the Active Media Player Screen Saver icon in your Windows tool tray to run the screen saver immediately, or for quick access to the configuration options! Options include: resume playing clip where it last stopped; show Media Player status bar; ignore mouse movements. The following image illustrate some of the configuration options and potential uses of the Active Media Player Screen Saver. Click on the image to view it in actual size. There are numerous sources of interesting media on the Internet. Many make for great viewing with the Active Media Player Screen Saver! and share your favorite clip list with friends! Or, load one of our sample media clip playlists.